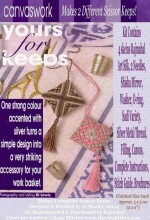 One strong colour accented with silver turns a simple design into a very striking accessory for your work basket. Kit contains all requirements to make both pictured keeps. SImple but stylish stitching with varaitions you may apply if desired. Rajmahal Art Silks, Needles, Shisha Mirrors, Washer, O-ring, Sadi Metal Threads, Canvas, Fibrefill. Clear and Complete instuctions with illustrated Stitch Guide. Click the button below to add the Scissor Keeps Canvas Work to your wish list.